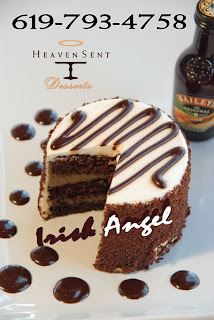 Our Irish Angel is very, very special and a treat from Heaven say those "in the know". One does not speak of proportions of a lady but suffice it to say that she has decadent chocolate, pure vanilla bean, rich creams and, of course, the nectar of the gods - Bailey's Irish Cream, in her make-up. The Irish Angel is featured for this rare last day of the month, this Wednesday 29th February, and will be offered at a special 29th on 30th Street price! Come in and taste, and take one (or two or ...) home with you, too!